There are very few things in life that are as satisfying as the annual Easter long weekend, and nothing so sad as the last few hours of the said long weekend. I did a fair bit of cooking and other domestic duties during the last couple of days and stocking my fridge until it fits to bursting. 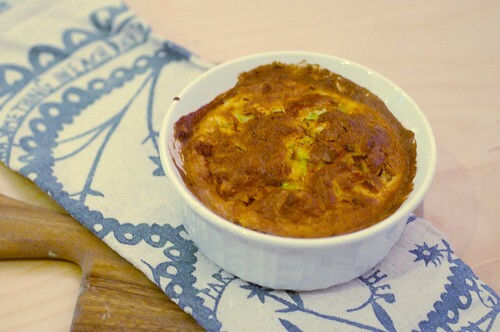 One of the dishes being this cheese, leek and herb souffle casserole from Martha Stewart. If you are not a fan of eggy souffle this one is probably one you might want to give a miss. I also find that I need to double the time needed for the souffle to bake or end up with a crispy top but still unbaked botto. Butter a 9-by-13-inch baking dish. Cut strips of parchment 4 inches wide and long enough to form a collar around inside of dish. Butter 1 side of parchment, and press unbuttered side against inside of dish. (Ends should overlap, and parchment should extend 2 inches above top of dish.) Place 1/2 cup Parmesan in dish, and coat sides well. Pour out and discard excess cheese. Melt 1 stick butter in a heavy saucepan over medium heat. Add flour, and cook, whisking constantly, until well combined and thoroughly heated. Remove pan from heat, and gradually add milk, whisking constantly until batter is very smooth before adding more milk. Add 1 teaspoon salt, and season with pepper. Return pan to medium heat, and whisk until souffle base is smooth, shiny, and thickened, about 12 minutes. Preheat oven to 200 degrees. Transfer souffle base to a bowl, and beat in egg yolks, 1 at a time, with a mixer on medium speed, increasing speed to high for 10 seconds after each addition to thoroughly incorporate. After last yolk is added, beat 20 seconds on high speed, then scrape down side of bowl. Add Gruyere, the remaining Parmesan, the leeks, and herbs, and beat until well combined. Beat egg whites with 1/2 teaspoon salt until stiff peaks form. Fold whites into souffle base, one third at a time, folding gently but thoroughly (a few streaks of whites are fine). Spoon souffle mixture into dish, and bake until puffed and golden, 35 to 40 minutes. Check the souffle when it’s out, if the mixture is still watery return back to the oven.